» The LARQ Water Bottle Review – Purification At Its Best! Over the years, countless newfangled forms of water purification product have appeared on the market promising great things. Some, of course, have delivered on their promises, but the vast majority failed to offer much of an improvement on their predecessors. 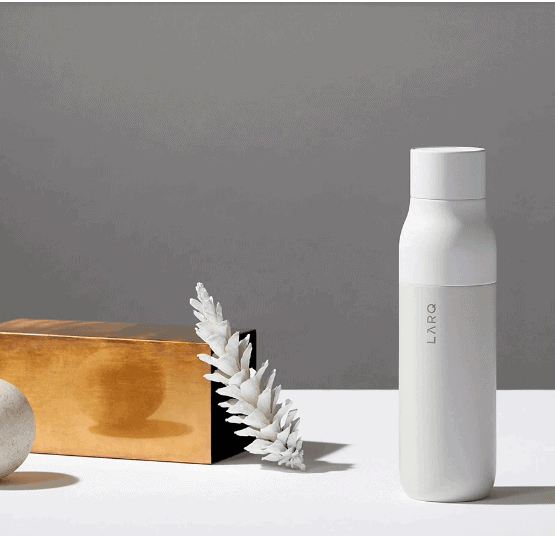 When a purification device like the LARQ Bottle appears on the market along with a bold claim to being the “most advanced in the world,” therefore, we are as curious as we are suspicious and have a long list of questions in need of answering. In the following review, we aim to answer those questions for our readers. Before we get down to our review of the LARQ Water Bottle, however, let’s first take a look at the most important factors that come into play when choosing a water purification system. Does the UV treatment leave a funky taste or smell? How often do I need to replace the bottle? How does the battery last per charge? What’s the difference between Normal Mode and Adventure Mode? How do you charge the LARQ Bottle? How clean must the water used in the LARQ be? Where is the LARQ Bottle made? Any water purification system’s effectiveness in treating pathogens, protozoa, and viruses is the gold standard by which it should be measured. In short, if it doesn’t do this, then it isn’t doing what we are paying for. Some systems, however, are far more effective than others, and before buying it’s wise to check which water-borne nasties your system will be capable of treating and then do some research to find out if it will have you covered in the area in which you plan to do your hiking or camping. One common distinction that we might make with regard to the effectiveness of different systems is that, for the most part, filter systems are effective in eliminating a very high percentage of protozoa and bacteria and will also filter our any grit or dirt in water taken from wild sources, but do not treat viruses. Other systems, such as ultraviolet treatments and chemical treatments are effective in treating viruses, bacteria, and protozoa, but can cost a lot more (in the case of UV devices, at least), take longer to make your water drinkable, and don’t filter out sediment. The best purification system for your backcountry adventures, then, will ultimately come down to where you plan on going and what water-borne illnesses you might catch there. While in North America and most parts of Europe water-borne viruses are very rare, if you’re heading overseas—to Asia or Africa, for example—to do your hiking, then it’s well worth investing in a purification system that effectively eliminates any viruses endemic to the region. How easy a water purification system is to use is another big consideration when buying. To help you choose, we’ve added a short description below of how each type of system or device performs in these metrics. Ultraviolet purifiers are generally very lightweight, portable, and effective in eliminating all types of pathogen and viruses. They’re easy to use and, in most cases, can give you safe drinking water in a matter or two to five minutes, depending on the model of device used. On the downside, their effectiveness can be reduced when used to purify water with high turbidity (murkiness), require batteries (lots of them, if you’re heading on a multi-day trek), and, like all electronic devices, are susceptible to malfunction or breakage. Light, cheap, very portable, and—in most cases—effective in eliminating all water-borne pathogens and viruses, chemical purification treatments would be the go-to choice of purification system for almost everyone, we’re sure, were it not for a few sizable drawbacks. The most notable of these is that it can take anything from 10 to 45 minutes for the chemicals to work their magic in making your water drinkable and they tend to leave a slightly unpalatable taste. Also, because no filtering is involved, users of chemical treatments will need to procure their water from a clear source to avoid every swig coming with a side of sediment! Generally speaking, water filtration systems are more practical for processing larger quantities of water. They work by using a pump or gravity to feed untreated water into a bottle or hydration bladder through a very fine filter that catches any bacteria. While filtration devices do not eliminate viruses, most models effectively remove in excess of 99.9% of other bio-contaminants. The benefits of filtration devices are, as mentioned above, that they allow you to treat much more water in a shorter time than most other systems. They are also relatively lightweight and come in a variety of sizes, with some models designed for solo hikers and other, “basecamp” models geared towards larger parties on longer, expedition-style trips. On the downside, filtration devices do not eliminate viruses, require a bit of manual effort (if using a pump-powered system), clog up easily if water is taken from turbid sources, and need replacing at regular intervals (the lifespan of filters varies from product to product). Straw filters are very light, cheap, packable, and ideal for solo travelers who can be confident of encountering frequent water sources on their route. They are effective in eliminating most bacteria, protozoa, and pathogens, but, like larger filtration devices, do not eliminate viruses. The main drawbacks to straw filters are that they cannot be used to store treated water and, as with larger filters, have a tendency to clog up when used to treat murky water. If buying a treatment system in bottle form with an integrated filter, the capacity of said bottle should rank high in your list of pre-purchase considerations. Generally speaking, there is usually a trade-off between weight and convenience in this respect, with larger-capacity bottles weighing more but saving you the inconvenience of having to stop and refill quite so frequently. Smaller-capacity bottles, on the other hand, usually weigh less but could leave you thirsty if you have to cover long stretches of terrain between water sources. Again, choosing the best device for you will come down to where and when you’re doing your hiking. If it happens to be in fairly arid, desert terrain in the dry season, then plumping for a larger-capacity bottle is naturally a better choice, but in more humid climes with frequent, reliable water sources, you will probably be able to get away with a 500-750ml bottle. While not applicable to all water purification systems (chemical treatments, for example, have no limitations in this respect barring shelf life), if buying a system that uses either a container or receptacle for your water, or an ultraviolet pen, it’s well worth ensuring that it will be ready to deal with the inevitable rough treatment it’s likely to be exposed to out on the trails. If you’re in the market for a bottle-style system such as the LARQ Bottle featured in this review, then the materials used in the construction of the bottle is a key factor to consider. While plastic bottles will usually help to save a few ounces in terms of pack weight, their lack of robustness compared to aluminum or stainless steel options means you’ll have to take extra care when handling the bottle and with how you stow it in your backpack. While this might not be so pressing an issue for those headed on shorter day hikes, for hikers on overnighters in the backcountry or putting in some serious mileage on thru-hikes, then cutting down on weight with all items of gear in your pack is likely to be a top priority. Generally speaking, the lightest purification systems out there are chemical treatments or those using ultraviolet light, with tablet-form chemicals weighing as little as a single gram per tablet and UV pens usually no more than 200 grams (7 ounces). Filtration devices vary greatly but can weigh up to 400 grams (14.1 ounces) if the filter is housed inside a drinking bottle or is intended for processing large quantities of water. If opting for a UV pen, remember to factor into your weight calculations the added weight of batteries. This may not be enough to break your back on a day hike or weekend trip, but if you’re on the trail for the long run then you could be looking at a significant increase in your pack’s overall poundage just to keep your device running. Another weight-saving option is the straw filter. These allow you to drink directly from any wild water source and treat water on the spot, while you drink, thereby precluding the need to carry any water in your pack. The only downside to using a straw is their inability to process larger quantities of water (for cooking, for example) and—because they do not store treated water—the need for reliable water sources at regular intervals along your chosen route. The value for money offered by any water purification system can be judged by calculating a cost per liter of treated water while also factoring in other considerations like the system’s durability, effectiveness, and ease of use. On the one hand, there are superbly cheap chemical treatments out there that weight next to nothing and effectively treat viruses, pathogens, and protozoa, but tend to make your water taste ever so slightly funky, take a long time to take effect (not ideal if you’re well and truly parched), and can leave silt or debris floating around in your water bottle, thus making for a few murky mouthfuls once you get to the bottom. Such treatments can cost as little as five cents per liter of treated water. On the other hand, there are a variety of water bottle filtration devices that will help you avoid all water-borne maladies with the exception of some viruses and also leave no taste and filter out sediment, but, on the downside, use filters that don’t come cheap and need to be replaced every few hundred liters. Now that we know what to look for in a water purification system, let’s get down to business with our review of the LARQ water bottle. The LARQ Bottle uses proprietary and patented UV-C LED technology that eliminates up to 99.9999% of bacteria and 99.99% of viruses. In an independent study conducted by Harrens Lab, the LARQ Bottle killed 99.9775% of E. coli after one minute of treatment, 9.9998% after 2 minutes, and 99.9999% after 3 minutes. While these figures really need no comment, this level of effectiveness places the LARQ Bottle up there with the most effective water purification systems currently available. As demonstrated by the study mentioned above, the LARQ can treat water in very short period of time, thereby negating one of the usual drawbacks of many varieties of UV sterilizer pens, some of which can take up to ten minutes to achieve the same results. Additionally, the LARQ uses a rechargeable lithium polymer battery that can last for 1-2 months and UV-C LEDs that can last up to forty times longer than conventional mercury-based UV technology and, because it functions without the use of a built-in filter, has no parts that require replacing at regular intervals. 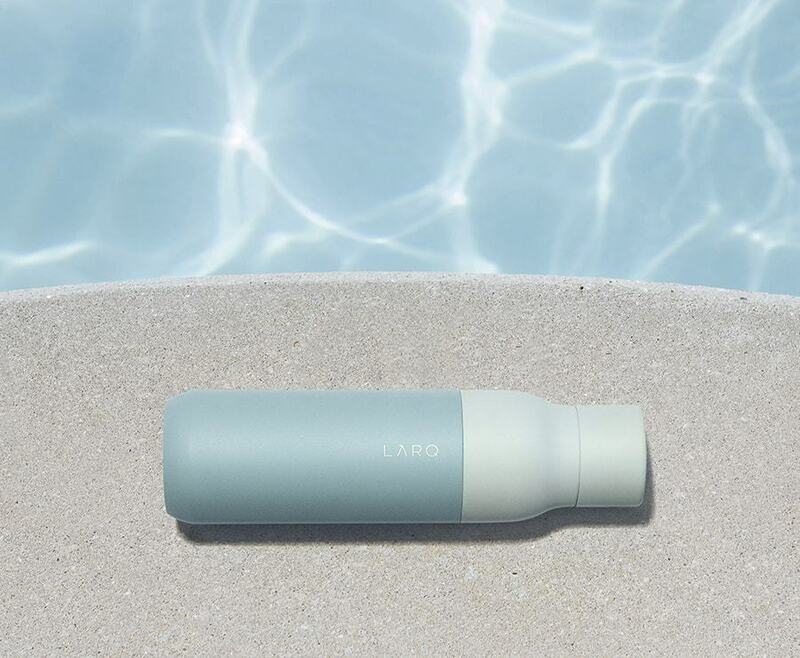 Perhaps most importantly, the LARQ Bottle is self-cleaning, meaning that no matter what you put in there and how long it’s in there for, when you go to drink it will be safe. It “intelligently” (that is, automatically) activates every 2 hours, thereby ensuring that your water remains fresh and funk-free even if left in there for weeks on end. 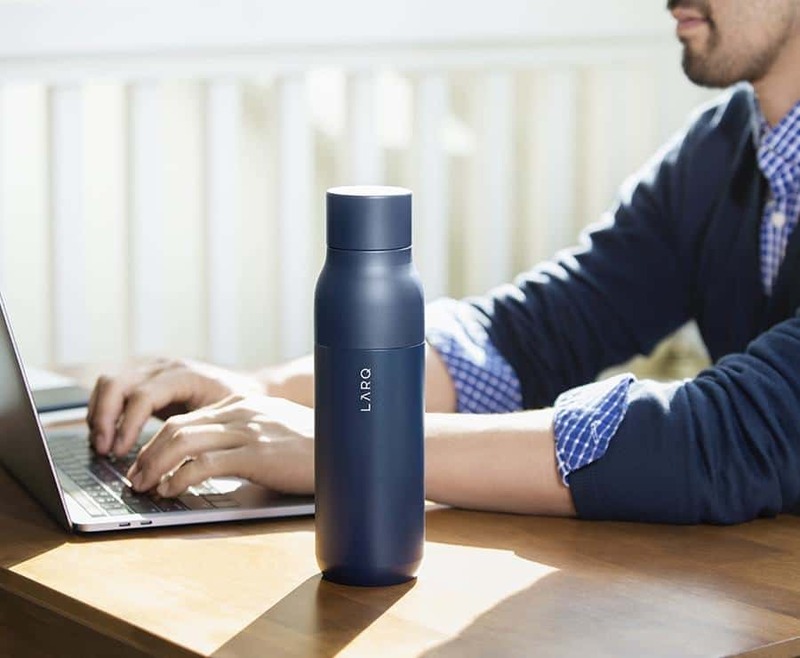 Finally, the LARQ does a good job of maintaining the temperature of its contents thanks to its double-walled, insulated construction, keeping cold drinks cold for up to 24 hours, and hot ones hot for 6-8 hours. 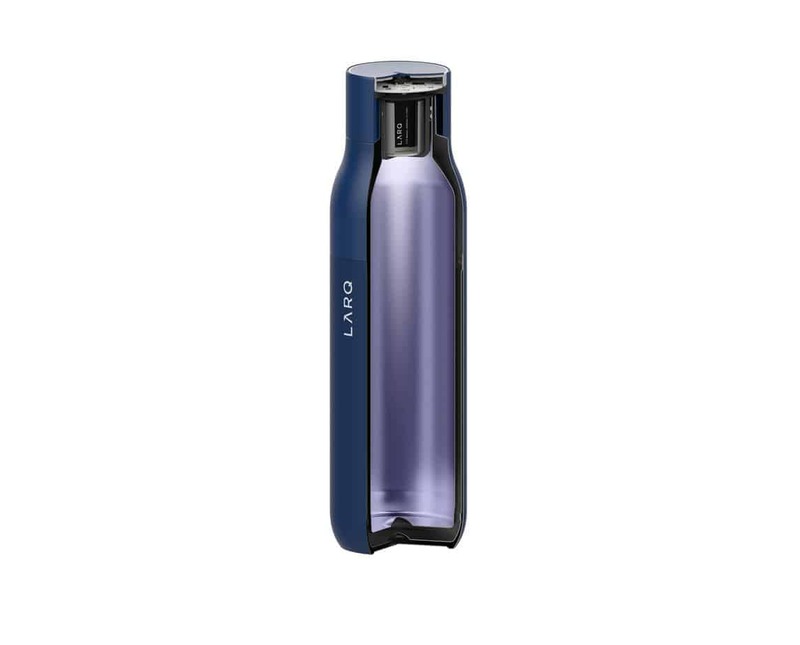 The 500ml (17oz) capacity of the LARQ water bottle will appeal to some and be viewed as a drawback by others. While this capacity might be ideal for shorter day hikes or an everyday carry, for hikers on longer routes that have infrequent water sources, it would most likely be preferable to have something in the one-liter range to ensure your reserves aren’t running dry when you need them the most. One simple way to get around this would be to carry a standard plastic water bottle with you and transfer its contents to the LARQ when needed, but this would largely undo the benefits of the LARQ’s small pack size and avoidance of single-use plastics and use of sustainable materials. The LARQ’s double-walled construction and the waterproof housing for its digital components mean it’s a bottle built to last for the long-term. The polished stainless steel material, moreover, is tough enough to deal with the odd drop, bump, or bang without suffering any more than light cosmetic damage. It also comes with a handy, 18-month limited warranty that covers repairs and the replacement of any defective material or components. At 13 ounces when empty, the LARQ Bottle is comparable to most of its competitors in the water purification bottle market, with other models like the slightly smaller GRAYL Ultralight Bottle weighing in at 10.9 ounces and the Lifestraw Go, which doesn’t eliminate viruses and uses a less robust, plastic construction, at 8 ounces. The price of the LARQ Bottle may put a few prospective buyers off at first, but when we factor in the additional, recurring costs required with other UV treatment systems or filtration devices for new filters and batteries, the LARQ suddenly starts to look like a bit of a bargain. Even if you were to drink just 2 liters of water per day over the course of just one year, then your daily expenditure on safe, clean drinking water would be in the region of a mere 24.5 cents. The LARQ Bottle uses patented UV-C technology that purifies both your water and your bottle with the simple touch of a button. The UV-C light eliminates bio-contaminants by destroying their DNA. No. In fact, the UV treatment counters the funky smells and tastes found in other bottles by eliminating up to 99.9999% of germs that cause them. In theory, never! The UV-C LED technology used in the LARQ Bottle does not require a filter replacement, so all you have to do is recharge the bottle cap to keep your bottle fully functional and processing potable H20. One charge lasts up to 1-2 months for Normal Mode and 10-12 days on Adventure Mode, which represents a vast improvement on the performance of comparable products. In short, the LARQ Bottle’s Adventure Mode uses three times as much power in order to safely eliminate the bio-contaminants more frequently found in wild water sources. Normal Mode, which uses less battery power, is ideal for treating water taken from regular sources if you have any doubts about its cleanliness. A USB cable connects to a waterproof (IPX7-rated) charge socket in the lid of the bottle. As a general rule, the water should be clear to the eye and free of any heavy sediment. The UV-C LEDs used in the LARQ are made in the U.S.A. 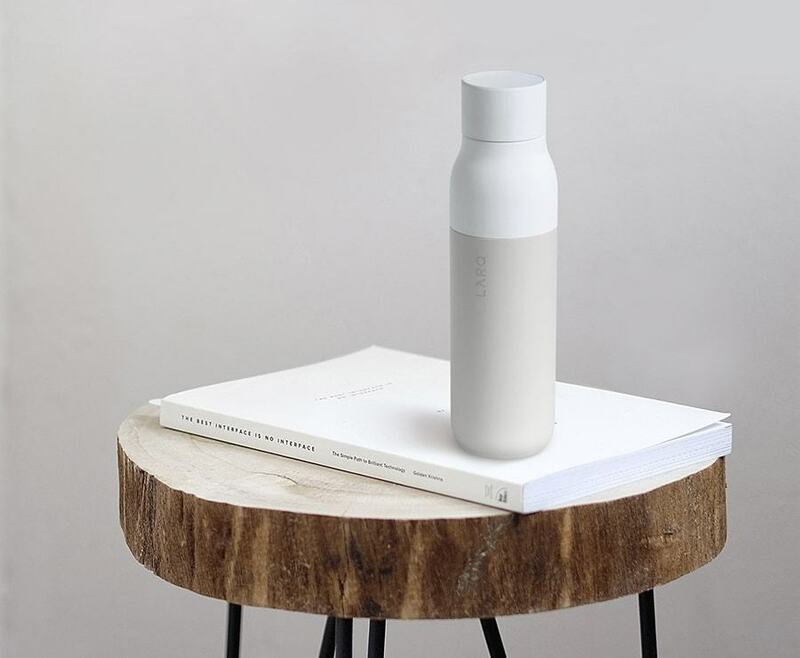 The bottle itself is designed in California (Silicon Valley) and made in Asia. To get straight to the bottom line, the LARQ Bottle is a bit of a game-changer in the field of water purification devices. Not only is this bottle as effective as any other device we’ve ever come across, it also offers a longer battery life than most other UV purifiers out there, has a robust and durable container, and requires very little wait time between filling the bottle and filling your tummy with clean, safe water. If you’re serious about staying healthy and avoiding a large number of water-borne baddies lurking in wild water sources in the backcountry, then this very nifty, peerlessly effective little bottle deserves a place somewhere very near the top of your shortlist of potential purchases.